You smile when you look at this quilt, don't you? It is a completely happy, irresistible quilt that is great for kids and adults. 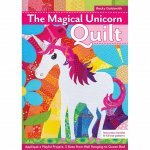 In fact, I designed The Magical Unicorn especially for my DIL, Celia, because she really wanted a unicorn quilt. There are 2 sizes of unicorn blocks (35" x 35" and 50" x 50") and 5 sizes of quilts (wall, crib, twin, throw, and queen) in the pattern. The block is printed full size, in both sizes. The pattern includes instructions for both needle-turn applique and machine applique, as well as finishing techniques. If you are going to turn under and glue your seam allowances for machine appliqué, you might be interested in the Apliquick Rods. This video will help you prepare the turn under allowances for machine applique. This is new since I wrote the book: Once the shape is ready to sew, I machine applique it with a straight stitch, fine cotton thread, and an open toe embroidery foot with the needle moved to the right. 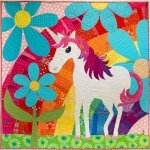 Alison Glass has put together a magical unicorn fabric bundle! I think her fabric choices are truly perfect for this quilt. Click here to go to her site for more info and to order.